For gates up to 1,000 lbs. or 37 ft. in length. Recommended for high-traffic, heavy-duty commercial applications. 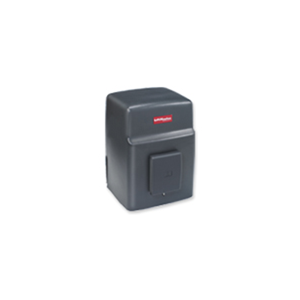 This is a LiftMaster Elite Series® SL3000UL Commercial Slide Gate Operator. The Elite Series® SL3000UL™ models of slide gate operators are the first choice for heavy-traffic applications and high-demand customers including large development and management companies, prestigious residential gated communities and custom home builders. The Security+ 2.0™ technology used exclusively in LiftMaster® remote controls virtually eliminates interference and provides up to double the range of standard remotes so you don’t have to wait at the gate to access your property. Featuring the highest quality components and backed by years of proven reliability, each unit is carefully inspected and mechanically tested to provide unsurpassed performance. Unique engineering innovations ensure that any SL3000UL™ models will meet the needs of almost every type of high-traffic gated entrance. All backed by the safety and reliability of the most advanced control board in the industry.